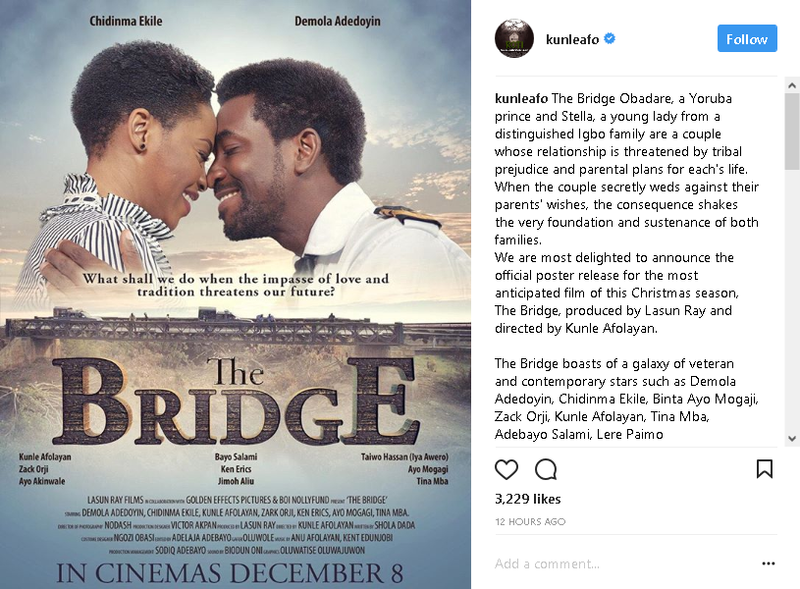 Beautiful and Charming Singer, Chidinma Ekile popularly known as Miss Kedike who recently ventured into acting, feature in a new movie titled "The Bridge", A movie directed by Kunke Afolayan and Produced by Lasun Ray. The Movie "The Bridge Obadare", is all about a Yoruba prince and Stella, a young lady from a distinguished Igbo family are a couple whose relationship is threatened by tribal prejudice and parental plans for each's life. When the couple secretly weds against their parents' wishes, the consequence shakes the very foundation and sustenance of both families. The Bridge boasts of a galaxy of veteran and contemporary stars such as Demola Adedoyin, Chidinma Ekile, Binta Ayo Mogaji, Zack Orji, Kunle Afolayan, Tina Mba, Adebayo Salami, Lere Paimo Wole Olowomojuore, Lanre Hassan, Jimoh Aliu, Mama Ray-Eyiwumi. Movie director, Kunle Afolayan took to his IG page to share the official poster release for the most anticipated film of this Christmas season, The Bridge.